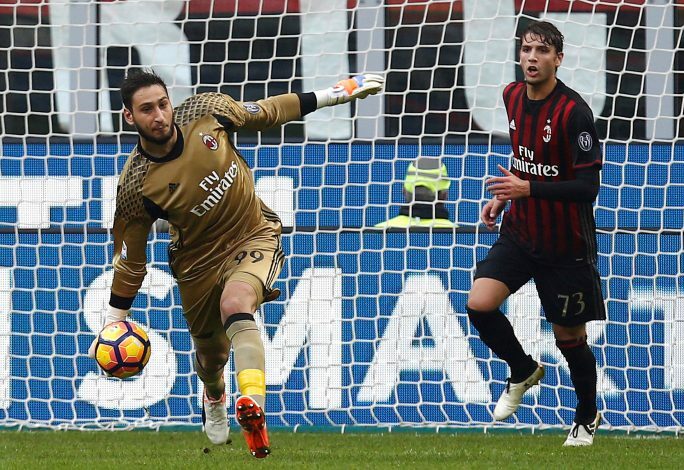 AC Milan goalkeeper Gianluigi Donnarumma will sign a new contract until 2022 with the Serie A giants, according to Sky Sports Italia. The report also claims that Donnarumma is said to have rejected a much better package from PSG to renew his contract with the San Siro outfit. There is no denying that the teenage sensation has been a big revelation since breaking into the first team back in 2015, and his incredible rise has seen him heavily linked with the likes of Real Madrid and Paris St-Germain. The Italian shot-stoppers’ current deal runs until 2018, but his agent Mino Raiola said in June that Donnarumma would not extend his contract with the Italian club until they come up with a better offer. There have been flurry of transfer speculations since Raiola made his verdict, while on the other side, Donnarumma himself received plenty of backlash from the fans for not remaining loyal to his boyhood club. The disheartened Italian fans threw bundles of fake dollar money towards the goalkeeper during Italy’s u21 European Championship match against Denmark in Krakow last month. However, the latest report in Italy claims that the talented Azzurri stopper has agreed terms for a new five-year contract at AC Milan, worth £5 million a season. Donnarumma’s contract reportedly has two buy-out clauses inserted into the deal – one which is £44m if they don’t qualify for the Champions League next season, while the other will rise up to £87m if Rossoneri are involved in Europe’s elite competition. The fresh deal will see Donnarumma become the third highest paid player in Serie A, whilst he will also be the third highest paid goalkeeper in World football.